The simple fact is that even though this is a free app you will almost certainly be deleting it after around 3 minutes when you realise just how bad it is. As are about to see from my descriptions below this game literally has nothing going for it and the 30 seconds it will take to download is a 20 seconds you will never ever get back. No sound to speak of….I am sure it would have been bad! It is not being unkind to say that this is perhaps one of the ugliest games I have ever come across. The text, the background, the harsh colours, it all just looks so darn ugly on the phone. The text is either too big or too light at times, the colours of the buttons clash with the background and it looks like something that has been cobbled together on paint. The 2 points here are mainly for the simple fact that it plays! 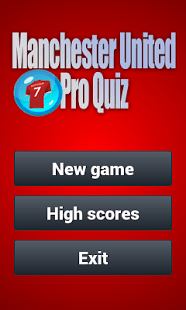 It works as any other normal quiz app would presenting you with question after question on Manchester United with 4 options…tap the correct option to build your score. But you won’t want to do that as not only are the questions dull, often not making sense and badly translated from whatever language they were written in, but half the time the answers are wrong! There is no games modes as such, no extra incentives to come back and just a whole load of nothing. Within 3 minutes it will be deleted from your phone. Nothing to see after you realise how bad it is, repetitive questions and a small databse….it just doesn’t work. Even fans will desert this game within a matter of seconds. No new modes, boring mundane questions and the whole Manchester United theme only makes things worse as fans will expect so much more. There is nothing new tried here and even the questions are old and some of them are just plain out of date! Avoid this app at all costs, as well as the above it has major crashing problems so if for some reason you do chose to answer more than three questions, the came is more than likely to crash out and leave you in limbo!